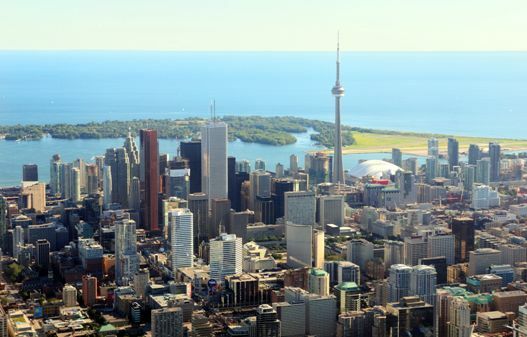 Toronto, the most populous city in all of Canada and the capital of Ontario, is often referred to as one of the "crown jewels" of the real estate market. As of 2011 over 2.6 million people lived in the city, making it the fourth most populous city in North America. With so many people in one place, real estate is sure to be an area of importance. Fortunately thanks to a constant stream of people moving to the city - about three percent of them immigrants - and low interest rates the housing market is healthy. Low interest rates have been record low since the rebound after the recession hit in 2008. This provided many with the opportunity to buy a home cheaply. As of the end of 2014 there were 56,000 condos under construction in Toronto - more than cities with even greater populations such as Chicago, Los Angeles and New York. This Toronto booming condo market has proved to be an affordable option for first-time buyers, renters and transplants. Back in the 1990s Toronto only had about 10,000 condos. Sales of homes have also tripled from the 26,700 transactions in 1990. Obviously this has created a lot of jobs. According to the Toronto Real Estate Board there is one realtor for every 140 residents - 39,000 realtors. However, most don't feel comfortable buying a home - at least not as comfortable as they would feel ordering a cup or coffee or choosing a movie to go see. About two-thirds of the real estate market in Ontario is controlled by five to six large agent networks. These agents include RE/MAX, Royal LePage, Sutton Group, Century 21, HomeLife and Keller Williams. RE/MAX, an American real estate company designed to organize real estate agents by allowing them to work together, came to Canada in 1979. In Ontario it has the most turnover. Royal LePage has the longest experience in the Canadian market. Founded in 1913 by 26-year-old Albert Edward LePage, the company is over 100 years old. LePage was also a founding member of the Ontario Real Estate Association and the Toronto Real Estate Board. The company is the largest that originated in the country, with over 14,000 agents. Shop A Property is another agent in Toronto, headed by Dmitri Alexandrovski and StanislavaPetrova. Around for over eight years, the company specializes in the core downtown Toronto condo market. Sutton Group came to Vancouver in 1983 and spread to Atlantic Canada within ten years. Now with over 8,700 realtors, it ranks within the top seven for number of closed deals in the Ontario-area. The company also claims to be the first to have its own website. Century 21 arrived in Canada in 1974, after it's successful launch three years prior in California. The company has several hundred independently owned brokers throughout Canada. In Ontario Century 21 ranks among the top five big realty networks. HomeLife, founded in 1985 and consistently spread since throughout Canada and elsewhere, only slightly lags behind RE/MAX and Royal LePage. Keller Williams, the number three residential real estate company in the United States, has steadily spread throughout Canada as well. In Ontario the company has 13 offices, with three in Toronto.